I finally got around to watching Fringe, after a year or two of constantly meaning to. It's a macabre but fun show where you have to suspend quite a bit of disbelief - they're always reading the memories of corpses, teleporting around, and growing single cells to the size of a greyhound. Sometimes they push my limits, but I've mostly been able to enjoy it. Then I saw this. 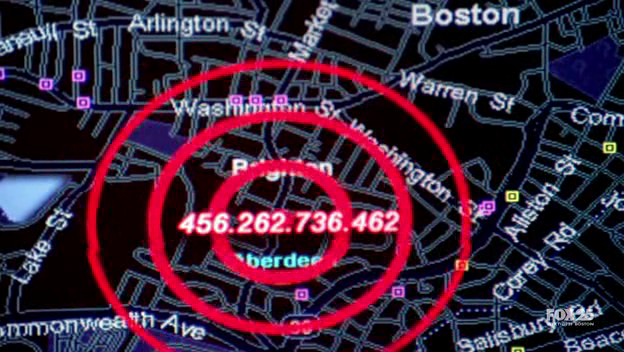 In their Operating System (that consists entirely of fancy maps and scrolling text), they have an IP address where every octet is over 256. 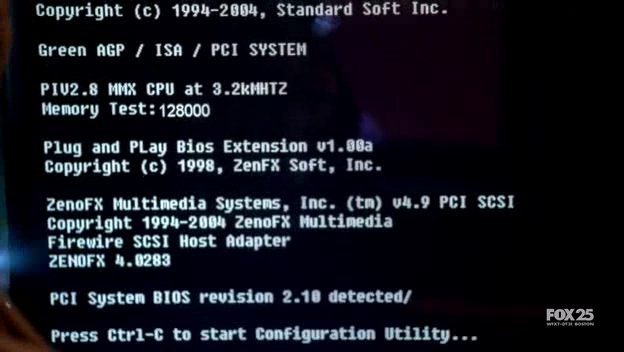 This was a bit of a surprise, so I went back through the scene a little more carefully to glean a few more facts about their computer. 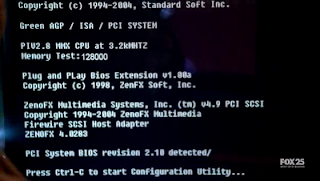 The text might be a bit small, but his computer is s a PIV 2.8 MMX cpu running at 3.2kMHTZ with 128000 memories. There's what seems to be a typo on the next line with the 'Plug and PLay' bios, and the rest is a nice mixing-pot of acronyms that occasionally make sense. 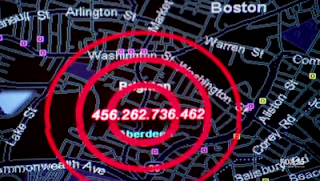 Here's more of the same address type: all IP addresses, but nearly all of the numbers involved are way too big. 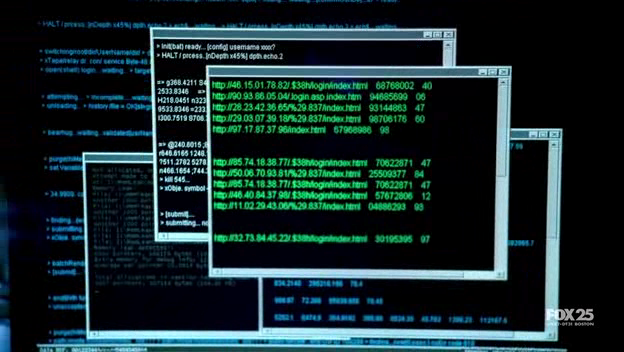 This time they've thrown in a few token two-digit numbers, but they're clearly not using IPv4 as we know it. It's hard to read, but that top window is full of extra IP adresses... this time consisting of 5 pairs of numbers. They've added a whole new octet but limited themselves to numbers below a hundred, which doesn't give them much more IP space to work with. 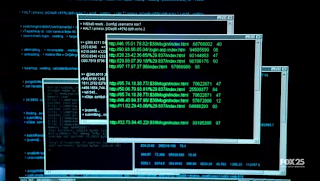 The only reasonable option I can think of is that these guys are working with base 10 computers and I've uncovered a major plot point later intended for later. It's reminds me of a cargo cult. 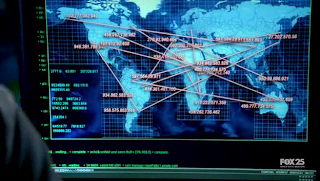 Whoever did this knows what a computer should look like, they vaguely remember the boot screen and they liked that map in Goldeneye. It's so close at the casual glance, but wrong in every single detail. Mindbogglingly, they had to use a computer to create all of this. 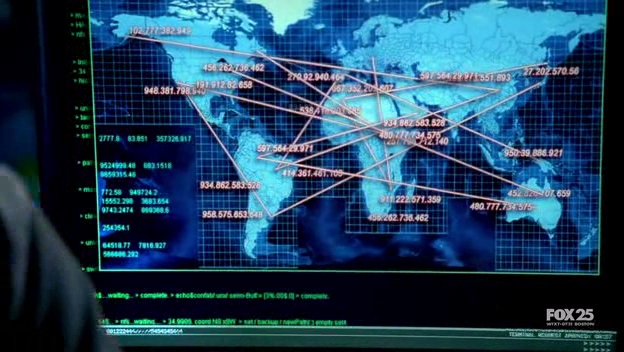 At some point in the process, people who know what an IP address is must have been involved. They stood by and watched somebody fake a a whole boot sequence for no good reason. If you want to see the whole scene, you can find it here. On the plus side, they have a rather nice Hard Drive sound effect.